Stevenson Society of America Inc. Statement of mission of the Stevenson Society of America Inc. The Stevenson Society of America was established in 1915 and in 1920 was incorporated as a not-for-profit educational entity and remains so today under the requirements of New York State Education Department. 1. to perpetuate the memory of Robert Louise Stevenson, author, in Saranac lake by the collection and preservation of records, manuscripts, books and objects pertaining to his lift and works. 2. to educate the public about him and provide a research center for scholars which includes documents pertinent to local history. 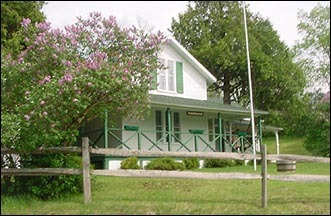 To these ends the Robert Louis Stevenson Memorial Cottage and Museum, is open to visitors daily on a seasonal basis and by appointment year round. The Museum is staffed by knowledgeable volunteers and membership is open to all who are interested in the author and his works and who desire to spread his brave philosophy of living. 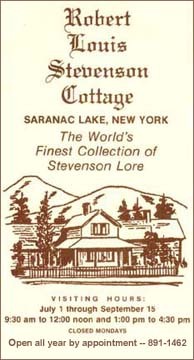 Here in this quaint old farmhouse you are taken back to the year 1887 when the immortal author of Treasure Island, Robert Louis Stevenson, came from Bournemouth, England to live in Saranac Lake. Still preserved in its original state, you will see the largest collection of personal mementos in America, such as Stevenson's velvet smoking jacket with a sprig of heather in the breast pocket which was sent from Scotland by a member of the Stevenson Society of America, the ice skates Stevenson wore to cut a fancy figure on nearby Moody Pond, his yachting cap, childhood photographs, a lock of his hair, original letters, and literally hundreds of articles of Stevenson lore. In the mantle piece over the fireplace are burns in the wood where Stevenson left cigarettes. The furniture in the rooms is that which he and his family used.